By organizing laundry supplies into fabric bins or boxes, your laundry room will be clean and easier to navigate. Consider a collapsible rack for drying clothes which can easily be stowed away when you’re done. This part of your home receives more wear, tear, love, and abuse than possibly any other part of the house. Consider deep cleaning your rugs or carpets at least once a year to remove dirt and debris that gets worn in. After the dreary days of winter, your outdoor welcome mat could use a little freshening up. Replace the worn out mat with a fresh, cheery one to greet your family and guests when they arrive. It’s recommended to replace batteries in smoke detectors twice a year. Daylight savings is a great time to remember to check them in the Spring and Fall. Over time, your curtains and valances attract dust and air pollution. Launder or dry clean your curtains and wipe down blinds with a wet sponge to remove dust. To clean your coffee pot, pour equal parts of white vinegar and water into the tank. Turn it on and run it for half of a cycle, pausing to let it sit for an hour before continuing. Follow by running fresh water through to remove the aftertaste. Spring cleaning means tackling even the messiest of piles! Eliminate unneeded items in your home or clothes in your closet that you haven’t used recently and won’t miss. Simplify your life by eliminating clutter and gain the freedom to spend more time doing what you love. Your home office is not exempt from a spring facelift. Organize your files and shred any documents which are no longer needed. Go through your computer and delete unnecessary files and backup important files on an external drive. Spring has no place for dust bunnies. 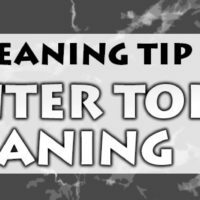 Do a thorough dusting of surfaces, bookshelves, mantels, lamps, ceiling fans, light fixtures and baseboards. Let no corner be left untouched. Your whole family will breathe much better for it. Refresh guest rooms with clean linens, fresh soaps, and fresh scents. Wash the pillows and add flowers for a clean, spring-like feel. By putting these tips into practice, your home will be clean, fresh, and ready for spring! However, if you’re busy and need help with house cleaning in Colorado Springs, we’ve got just the services for you. Contact us today for more information. Did this help you? Post a comment and tell us about it. You can find other time saving House Cleaning in Colorado Springs tips from Maid to Shine here. Tip #9 is my favourite. I do it every time and it’s really crucial to fast cleaning. Thanks for sharing everything was very helpful to me. Great tips!! A professional house cleaning service is important to ensure a safe, comfortable, hygiene and clean living space where you and your family members can relax.